Over the past handful of years, the midsize SUV class has become one of, if not the, most competitive segments in the entire automotive industry. More and more drivers are looking towards these SUVs and crossovers for a good balance of space and efficiency. 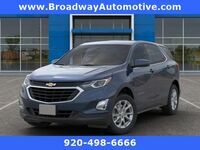 Even with all the options and choices though, the Chevrolet Equinox has set itself apart as one of the premiere models in the class. Now, after months of excitement and build-up the newest Equinox, the 2019 Chevrolet Equinox, is finally here and available at Green Bay, Wisconsin! The new 2019 Equinox looks to be the best iteration of the SUV yet! If you’re looking to learn more about the 2019 Chevy Equinox, you’ve come to the right place! We’re going to break down everything about the 2019 Equinox from its powertrains to its interior space to its safety features, right here! Let's see what the this Chevy SUV has to offer! Let’s start underneath the hood! The 2019 Chevy Equinox has three different engine options for drivers to choose from. First, there’s the standard 1.5-liter Turbo engine that offers solid power to go along with its EPA-estimated 32 highway mpg. Next, there’s the 2.0-liter Turbo that offers drivers the best towing, with a capacity of 3,500 lbs. Finally, there’s the 1.6-liter Turbo-Diesel that offers an incredible EPA-estimated 39 highway mpg! The interior of the 2019 Equinox is designed to be as comfortable, roomy and convenient as possible. The rear seats are 60/40-split folding for adaptability and drivers can fold down both seats to unlock the maximum cargo volume of 63.5 cubic feet! And, it's easier to access the cargo area with the available hands-free gesture liftgate! Once inside the 2019 Chevy Equinox, drivers have access to numerous technology features for a better and more fun drive! Like the available Apple CarPlay and Android Auto functionality for seamless smartphone integration to get all your favorite music and apps! Plus, the Rear Seat Reminder will make sure you don’t forget anything in the back seat again! Want to learn more about the 2019 Chevy Equinox? Contact our staff at Broadway Auto for more information or to schedule a test drive today!